This listing is for a 18-piece complete LARGE NATIVITY SET. The total weight of all the pieces are 1258 lbs. The set is made out of cement. The set includes 25" Mary , 25.5" Joseph, 10.5" Baby Jesus , 28.5" shepherd, 28" angel , 30" shepherd with hat and llama, 32" shepherd with horn and dog , 31.5" King standing with vase, 21" shepherd with bald head , 25.5" King with Jewel Box, 21" King Kneeling with vase , two 9" Grazing Sheep, two 9.5" Lying Down Sheep , 18.5" Donkey, 19.75" Bull , 34" Camel. The set is shown in a flat finish, but we can paint them in full detail. As stated above, the set is shown in a flat finish. It is also available in any of the colors shown below. Timeworn Mountain Mossy Mountain Campfire Stone Cedar Water Stone Gravel Mountain Everglade Stone Black Mountain Carnelian Mountain Rococo Bronze Brown Sugar Bronze. Desert Clay Stone Brown Stone Old Stone Cool Grey Pearl Antique White Grees Moss Adobe Stone Mocha Stone Classic Stone. Classic Weathered Stone Classic Sand Stone Classic Iron Classic Amber Classic Patina Classic Patina Gold Flint Stone Classic Penny Classic Cliff Patina Classic Cottage Bronze. Classic Mountain Bronze Classic Pebble Bronze Natural. We do sell the INDIVIDUAL PIECES as well. We also make different size nativity sets, using different materials as well. If you have any other questions, please feel free to ask. 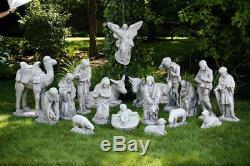 The item "18-piece Large NATIVITY SET religious christmas outdoor" is in sale since Monday, April 12, 2010. This item is in the category "Home & Garden\Holiday & Seasonal Décor\Christmas & Winter\Figurines". The seller is "marshallbennettgalleries" and is located in Nanuet, New York.